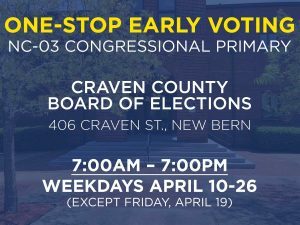 The Craven County Democratic Party relies on contributions from our members to pay the rent and keep the lights on at our party headquarters, to run get-out-the-vote and issue advertising on social media, and to purchase materials we’re using to turn Craven County blue! Please consider a one-time or monthly recurring donation to help support our efforts! Online via ActBlue, a secure political contribution site. In-person at our monthly meetings or by stopping by our party headquarters. With your contribution, please include your name, mailing address, occupation, and employer, for campaign finance filing purposes.